The need to finish. I’m not a huge list-maker, although I’ve been known to make lists and add random things that I have already completed just to cross them off. Similarly, my husband Jeff is recovering from lifelong OCD…I say “recovering” because one cannot possibly maintain a truly OCD level of cleanliness and order and simultaneously have three small children…that, friends, is a one-way ticket to Straight-Jacket City. Jeff has learned to let some things go (this could also have something to do with my crappy housekeeping…since I stopped working to stay at home with the kids, Jeff has this crazy idea that I should also be doing all the cleaning…). Jeff has not, however, let go of the OCD compulsion to finish everything. He lives and works in constant attempts to get time to relax…but when he finally completes all tasks, he can’t slow down. Half an hour of TV and he’s finding something else to do. So…I have compiled a list of things foreign and domestic that currently drive me crazy because they’re never…quite…finished and would drive me crazy if I were ever dumb enough to think I could take on that job. 1. Dishes. I run the dishwasher at least once per day. Sometimes twice. And even if I’ve closed the dishwasher door and started it, I find stuff around the house. I think my kids are using plastic forks as play swords. And colanders as hats. 3. Toys. People, I get rid of toys all the time. I surreptitiously donate to Goodwill, put away for the consignment sale, and blatantly throw stuff away. BUT…it somehow multiplies. I don’t know how, but even after cleaning stuff out, there are still toys everywhere. Would it be tacky to ask people to donate to our Disney fund instead of getting the kids birthday presents? 4. The Litter Box. I’m not sure if I’ve ever written about our cat Georgia. She is our oldest child, adopted from a shelter when we were still dating back in 2004. She is very cool and has weathered the birth of three kids and an adopted golden retriever with patience and grace. Does that make cleaning her litter box any more pleasant? Nah. And I’m not gonna lie, I kind of got used to the “no cleaning the litter box because you’re pregnant” rule and considered it Jeff’s job forevermore. He disagrees. Dang. 5. Um, You Know, General Housekeeping. Self-explanatory. I know there are other domestic never-ending chores, but these are the “foreign” jobs (read: out of the house, big-girl with a paycheck jobs) where I would feel the same crazy “never doneness.” I applaud any of you who can do these jobs because I’m pretty sure I would jump off the tallest thing I could find in our town if I had to try any of these! 2. Stocker at a Grocery Store. I could never ever in a million years stock grocery aisles. It would drive me nuts to rotate the older food to the front while putting newer food behind it. If I had just gotten my shelves perfectly lined up with lovely canned goods, I might just tackle whomever came to ruin my perfect creation by picking something off the shelf. Even as a shopper, I sometimes want to move things to the front so they’re all lined up. I know…sick. 3. Restaurant Server. Friends, this is a job I’ve done and not been good at. I LOVED the social aspect of talking to people I didn’t know, cooing at babies, helping people celebrate special occasions, etc. But there are aspects I could not stand and was never good at. In restaurants, servers also have sidework to keep the kitchen running smoothly (filling ice buckets, rolling silverware, refilling salad dressing, etc.). Unfortunately, my fellow servers did not appreciate that I was so busy socializing with customers that I couldn’t be bothered with sidework. 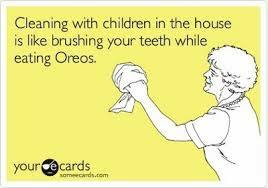 Similarly, as I’ve always hated to clean, that aspect carried over to this job. I hated cleaning up after people, and I hated cleaning at the end of the shift, knowing that someone was going to come eat there and mess it all up again in a few minutes. I was a TERRIBLE SERVER!! So anyway, I invite you to think and comment on jobs (foreign…like outside your house… and domestic) that drive you nuts. After re-reading this it sounds like I’m the OCD one, but really, I think I’m just lazy. I am so with you on people who can’t be bothered to return shopping carts to the corral! That drives me insane. No way I could do that cart attendant job, or anything to do with math. Or anything that involves camping, such as an outdoors guide or something. I like nature and exercising outside, but at night, I want to be mosquito bite-free and in a bed.